It was close, but I managed to finish them all. Off the shelf was the hardest one. I picked 50 book goal and succeed only because I counted omnibus books as two. Terry Pratchett (1) 4 Done! New Author (25) 30 Done! Off the Shelf (50) 51 Done! Once upon a time (5) 14+2+1 Done! Once again I’m amazed at how many new series I started (22) but then read only 14 in the Seconds challenge, and most of them in different series or the second time I read an author. I read 30 new authors and most of them fell in the OK category (could read more but not in a hurry). However, I will try out Caitlin Kittredge’s other series. I’ve certainly learned my lesson for this year. I’ve only joined six challenges with a lot of overlapping books. And my goal for TBR books is just 24 although hopefully I’ll have the time and inspiration to read a bit more of them. Carl at the Stainless Steel Droppings is hosting a read-a-long of Neil Gaiman’s Graveyard Book. Begin reading anytime between immediately and October 1st. from October 1st through October 6th. Post your thoughts on these chapters on Sunday, October 7th. from October 8th through October 13th. Post your thoughts on these chapters on Sunday, October 14th. from October 14th through October 20th. Post your thoughts on these final chapters/the book on Sunday, October 20th. I haven’t read the book before and, frankly, I’ve been discouraged because it’s a YA and overall I’ve always liked Gaiman’s comics and short stories more than his books. Hopefully, the book will be good. Carl at the Stainless Steel Droppings is hosting the seventh R.eaders I.mbibing P.eril, or R.I.P. R.I.P. VII officially runs from September 1st through October 31st. I don’t really care for horror, so I’ll be reading mystery and thriller books and perhaps dark fantasy. I’ve got loads of mysteries on my to-be-read pile and some Dark fantasy and thrillers, too. I’ve watched almost all of the X-Files for the past eight months and I’ve still got the last season to go. Also, I’ve just bought the first season of Sanctuary. I’ll also join the group read of Neil Gaiman’s Graveyard book. I’ve fallen sadly behind on my Gaiman reads so this is a change to catch up a little. Cheryl Mahoney of Tales of the Marvelous is hosting Summer in Discworld: Terry Pratchett Reading Challenge and I’m signing up. Pratchett is consistently responsible for the funniest books I read each year, and I wanted to share the laughs. This is a challenge only in the loose sense–all you have to do to participate is read any book from Pratchett’s sprawling 40-book Discworld series between June 1st and August 31st, and tell us about it. There’s a separate review page. She also hosts a group read of Going Postal and if I can get the book, I’ll join in. Carl from the Stainless Steel Droppings is hosting Neverwhere read along and I decided to participate. I’ve read Neverwhere before but that was years ago. I haven’t seen the TV show or graphic novel, though. Read the Prologue through Chapter 5, May 13th-20th. Discussions for this section posted Monday, May 21st. Read Chapter 6 through Chapter 6 through Chapter 12, May 20th-May 27th. Discussions for this section posted Monday, May 28th. Read Chapter 13 through the end (Chapter 20), May 27th-June 3rd. Discussions for this section posted Monday, June 4th. I’ll be taking part in Quest the First: Read at least 5 books that fit somewhere within the Once Upon a Time categories. They might all be fantasy, or folklore, or fairy tales, or mythology… or your five books might be a combination from the four genres. And Quest on the Screen: Stories are not just limited to the printed page. Many entertaining, moving, profound or simply fun stories are told in the realm of television and film. To participate in this quest simply let us know about the films and/or television shows that you feel fit into the definitions of fantasy, fairy tales, folklore or mythology that you are enjoying during the challenge. And Short Story Quest: This quest involves the reading of one or more short stories that fit within at least one of the four genres during the course of any weekend, or weekends, during the challenge. Ideally you would post about your short story readings on Sundays or Mondays, but this is not strictly necessary. I was tempted to take on Quest the Second (Read at least one book from each of the four categories) but I’m unsure about differences between the categories. Would, for example, a Robin Hood book be folklore? I don’t think it’s mythology because the stories don’t (usually) have supernatural elements. I have a tendency to put all fiction books into fantasy when they have mythological or fairy tale aspects. Is steampunk fantasy? It’s usually lumped in with science fiction. This event was not to be a challenge. It was not a dare nor was it a contest. It was meant to be an experience, a word I did not choose at random. 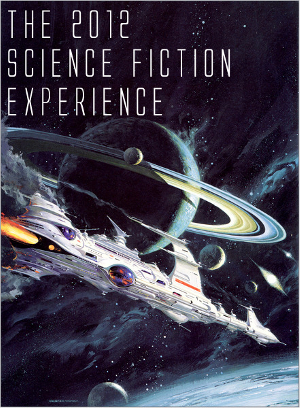 And so I officially welcome you to The 2012 Science Fiction Experience, which runs from January 1st, 2012 through February 29th, 2012. That’s right, we get an extra day this year! Woo-hoo! The “rules” of the experience are simple: there are none. Remember, this isn’t a challenge. If you would like to join us in reading and discussing any science fiction reading or television viewing or movie watching you do over that time period, please do. I have quite a few unread SF books on my shelves but I recently bought a bundle of Kristine Kathryne Rusch’s novellas from Smashwords so I’ll probably read those first.